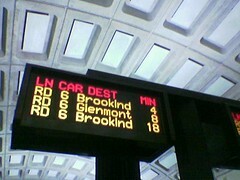 Red Line appears to be going to Brookland every other train on the Glenmont side. That doesn’t normally happen; isn’t it usually Silver Spring? Yes, it’s normally Silver Spring. There’s no reason for it, either.